10.0 Beam trolleys should not be used on any beam other than those designed, tested and marked as a runway beam with exception that they may be used on a beam forming part of a structure where a specific design check has been made for this purpose and end stops or a suitable means of preventing the trolley running off the end of the beam have been fitted. The beam should also be sufficiently level under all loading conditions such that the trolley will not run away under gravity. 10.1 Beam trolleys are in the main, adjustable to suit specific range of beam widths. 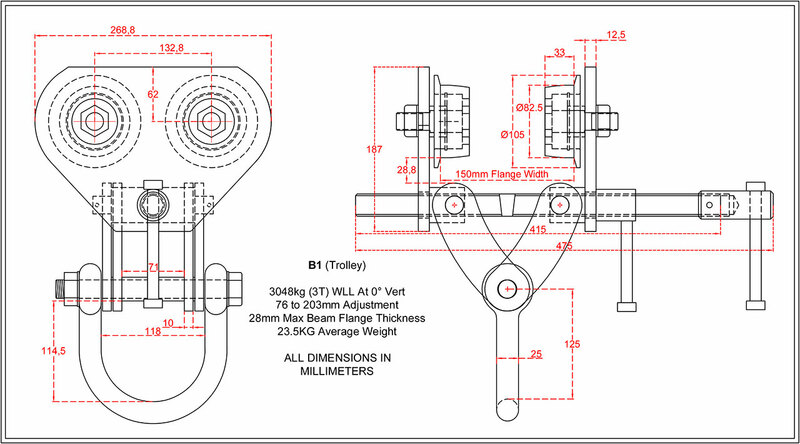 Adjustment is achieved by means of a screwed adjusting bar operated by turning the handle body. 10.2 There are two types of beam trolleys available, push travel (see fig. 10.1) and geared travel (see fig 10.2). 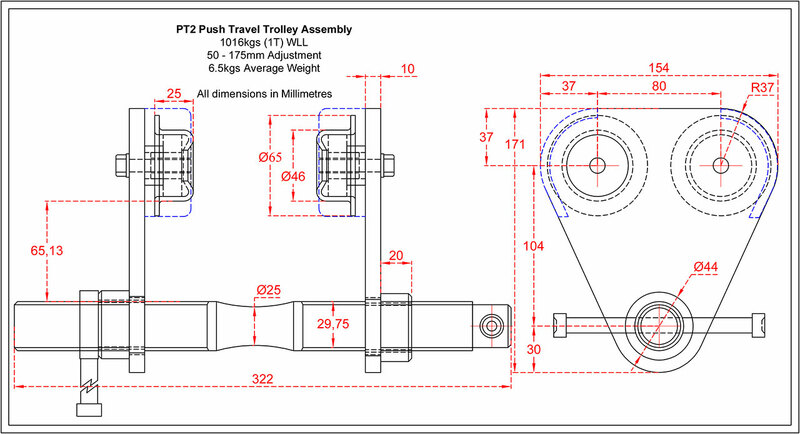 Push travel trolleys are normally used for loads of up to 6000kg and linear movement is achieved by pushing against the load. Geared travel trolleys are preferred when loads in excess of 6000kg are to be handled or accurate positioning is required e.g. alignments of flanges, bolt holes etc. 10.3 The W.L.L. of the trolleys must be adequate to take the load to be lifted plus the weight of the hoist and the operating chain (where fitted) should be long enough to hang approximately 2 feet above the operating level must always be picked up, travelled and landed directly below the runway beam. The W.L.L. is adequate for the load. The colour coding (where applicable) is current and the trolley has a plant number. ID mark. Examine side plates and check for ware, distortion and cracks. Examine wheels, axles, bearings, wheel treads and flanges. If geared travel, check gear teeth on wheel flanges and drives sprocket of hand chain wheel shaft for alignment, broken teeth etc. Examine hand chain and hand chain wheel to ensure chain seats properly in the chain sprockets. Check hand chain guides are not deformed and are correctly positioned to ensure smooth feed of chain into chain wheel. Examine suspension shackle for ware, distortion and cracking. Where an adjusting bar is fitted, check for straightness and examine threads for stretch/damage and check function of locking device. Ensure both the female threaded knuckles (mounted on the side plates) are not damaged or deformed. 10.6 Measure the beam flange on which the trolley is to be fitted and while the trolley is still on the ground/deck, open out to just over the beam flange width, hook on one side of the trolley and close again until desired width is obtained. 10.7 Remember to lock the adjusting bar. Please note, on the PT model’s the adjusting bar is locked by a screw located in the adjusting bar collar. 10.9 Ensure the beam flange is clear of any obstructions and is clean and free from debris. 10.10 Ensure operating chains will not foul or snag during travel. 10.11 Subject the beam trolley to side loadings. 10.12 Overload the beam trolley.